The German Expedition Team-The Transmission of Buddhist Culture:The Kizil Grottoes3. done line drawings by Grünwedel as well as Ernst Waldschmidt are of great value to us today. 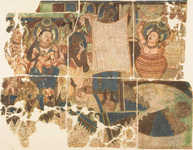 The German Team, in addition to their onsite research, were to also cut out many murals from the Kizil site to bring back to Germany. The technique which they employed was to “cut round” the designated area “with a very sharp knife -- care being taken that the incision goes right through the surface-layer -- to the proper size for the packing-cases[b];” carefully cutting “the boundary line in curves or sharp angles to avoid going through faces or other important parts of the picture[b].” After this step was completed, they would then make a hole with “the pickaxe in the wall at the side of the painting to make space to use the fox-tail saw[b]. In cases where the surface layer of the cave walls were unstable, they would press boards covered with felt firmly onto the painting as they were being cut out. have been cut out, or where the team quit their work part way through the procedure after making straight cut marks. The cut-out paintings were transported back to Germany along with sculptures(18), painted boards(19), and manuscripts; all in all making for a magnificent collection for the German team, which far outshone anything achieved by past expeditions. The result of this excavation was compiled into reports such as the seven-volume Die Buddhistische Spätantike in Mittelasien[c], contributing greatly to research on the Kizil Grottoes.